Rose Paw Print Kraft Shopping Bags 250 Pk 5-1/2x3-1/4x8-3/8"
Rose size Paw Print Kraft Shopping Bags by the carton are made from 100% recycled kraft paper. Green Way ® Eco-Friendly Packaging. Bags are 100% recyclable and contain minimum 40% post consumer recycled content. This is a Nashville Wraps exclusive design! Made in the USA. 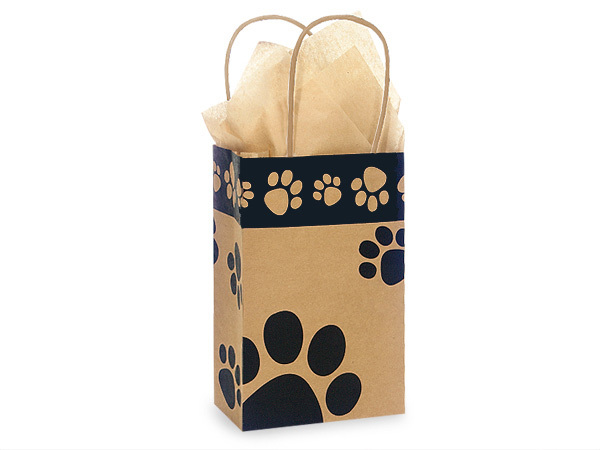 Our Paw Print Paper Shopping Bags in 100% recycled kraft will make a statement! Bags are 100% recyclable and contain minimum 40% PCW content. Our exclusive bag features a classic border with reversed paw prints and black paw prints over the rest of the bag. This bag also carries our Green Way logo and is imprintable - great for pet stores, caterers and makes a great "doggie bag". Individually UPC coded for resale.Made in the USA.